And, off to “Christmas Party Pianist Los Angeles” mode we go! I love December! 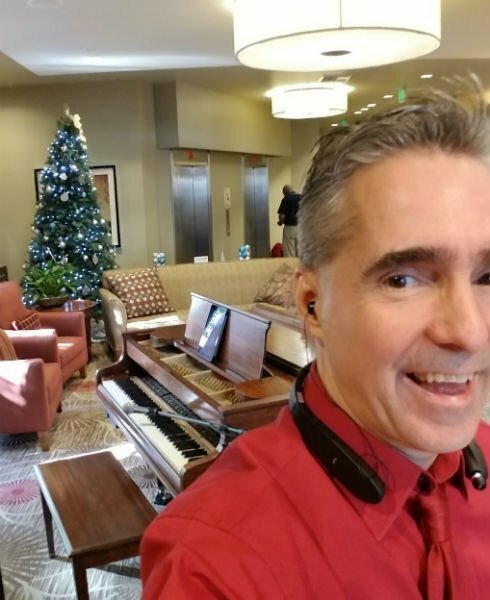 It’s the fun parties…and the pianos! And, speaking of parties, it all started this past week! First, not really a “party” but the decorations are up and the mood was festive at Red Restaurant on Tues! Great crowd – we had a lot of fun. And speaking of decorations Larsen’s on Wednesday night. The decorations are awesome! And Christmas is in the air. We had a blast, especially for a Wednesday night. Then, Thursday at the Waldorf Astoria where Deutch Bank did the annual Holiday Smash for their awesome clients. I love that venue. Rooftop…OMG! Spectacular! And, a grand party it was indeed! Friday- and Back to Larsen’s for a super jam-packed fun night. It was just wall to wall fun from 5:30-10pm… I mean, I stayed an extra hour it was so fun. And then there was Saturday, party at Vintage Burbank where I had lots of senior hanging out for most of 2 hours singing carols and having a great time. Yaaaay!! My “job” rocks!! And then I was off to the company for DSP WONDERFUL Christmas Party at the amazing Parker’s Lighthouse. AMAZING Location. Amazing people. I love these people!! Sunday Church, we are singing hymns, I love that. I think everyone just loves them. Then I had a movie premiere party…at the amazing Chateau Marmont in Beverly Hills, CA baby! Such a beautiful, vibey venue. Super cool to hang with all the awesome movie people. And make 40’s music to match the Hedy Lamar Film Vibe!! And better, this new week… Office parties, Wine Expo, Country Clubs, Wild Musical Christmas show for 100s or people….and OMG, I love this time of the year. 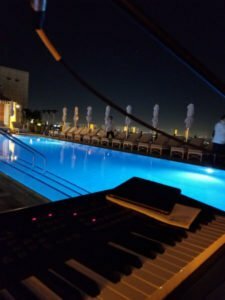 Book Mr. Christmas Party Pianist Los Angeles!